Philip Renfroe compares the years after his “second conversion” to waking up early in the morning and walking through a very thick fog. As the day progresses, the fog lifts, but early on, you can’t see where you are or where you’re going. After working for years as a medical doctor in a rural Kenyan hospital–a 300-bed facility serving half a million people–Philip learned new things about Kenyans that changed his whole perspective. All of this resulted unexpectedly from a great trial facing Philip’s Christian colleagues. But isn’t that just how our God loves to work–to take a hopeless, difficult situation and turn it into something profound and life-changing? While working through a difficult conflict in the ministry, one of Philip’s colleagues suggested seeking outside counsel. Dennis Tongoi was brought into the picture–he is DNA’s representative in East Africa and the leader of DNA’s partner Samaritan Strategy Africa. Instead of discussing strategy, budgets and business, Dennis talked about what it means to have a biblical worldview. He explained the impact of animism on African churches and the impact of humanistic secularism on Western churches, giving specific examples that resonated with Philip and his group. Dennis encouraged the ministry leaders to change their whole approach to this certain problem, but his involvement didn’t stop there. A few months after meeting, Philip attended a DNA Vision Conference led by Dennis. He soaked up more DNA teachings on biblical worldview and seed projects, deciding his missions organization, World Gospel Mission (WGM), needed to hear these things. 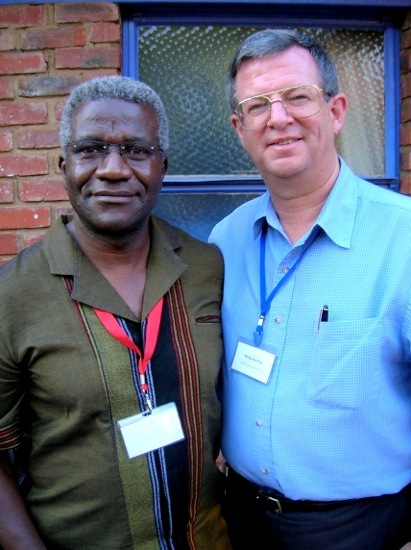 Philip and Dennis organized another Vision Conference, this time for 70 Africa Gospel Church leaders and 30 WGM missionaries. 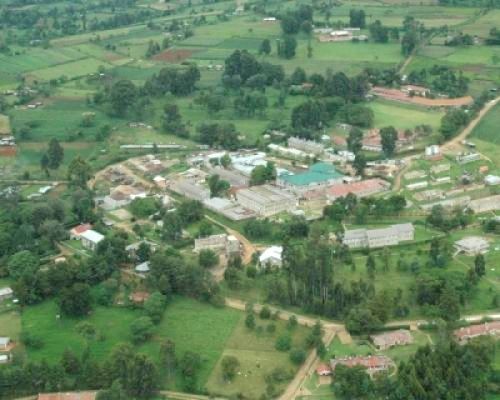 Out of that grew a vibrant ministry at the local Bomet Prison (learn more about that). Philip’s next plan was to have Hubert Harriman, president of WGM, meet Dennis. This came to fruition in the lobby of a Nairobi hotel. 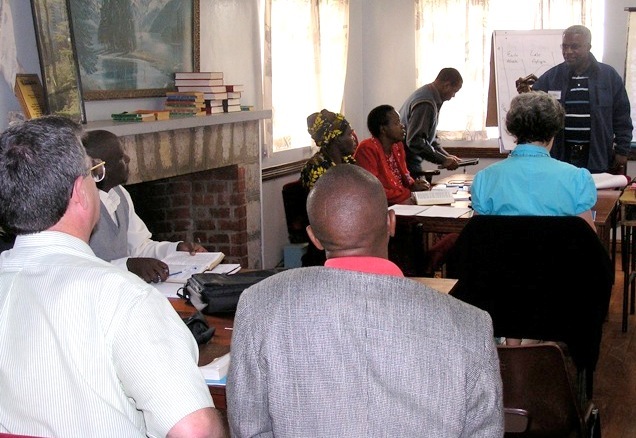 Dennis (top right) conducts “Trainer of Trainers” workshops as a strategic way to multiply DNA teachings. Hubert, a former pastor, began to see what Dennis meant by “humanistic secularism”–how he and the Western church had set a division into something that meant to be whole. There are two rails, Hubert says: the rail of the spiritual (holiness) and that of the social (people’s needs). The tendency is to separate the two. 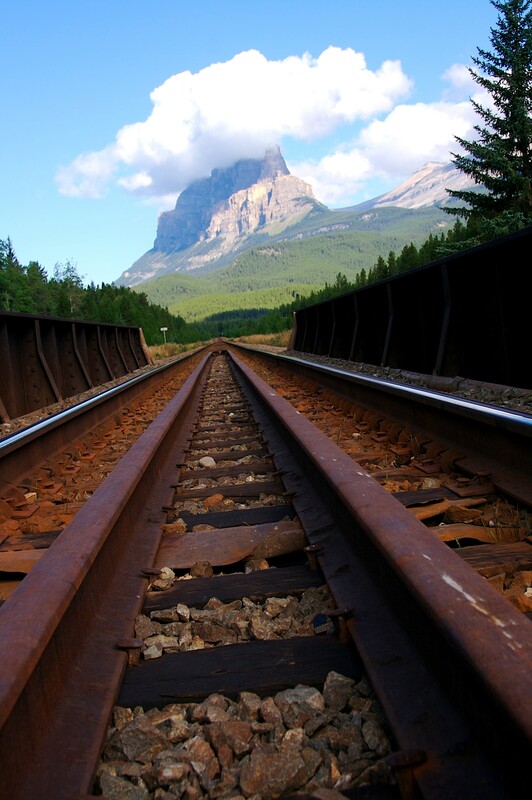 “I had the same tendency and realized these rails run together; they make a track. If we don’t run these two rails together–parallel–we will get off track,” Hubert says. WGM is an organization more than 100 years old; an establishment like that doesn’t change quickly. But when its top leadership experiences a head-and-heart change, as Hubert did, movement can be swift. Hubert and other top leadership dove deeper into DNA teachings, assembling a conference with 20 WGM country directors from around the world to talk about integrating physical and spiritual ministry. The board of directors then agreed to adopt a more intentional focus on wholistic community transformation, with Philip in charge. This plan enables WGM field workers to go back to established churches and help them discover how to minister wholistically to their communities. New missionaries not yet deployed will be trained as well, and even the 30-plus employees in WGM’s administrative office in Indiana will have a two-day training this coming January. Contact Philip Renfroe or Hubert Harriman at wgm@wgm.org.